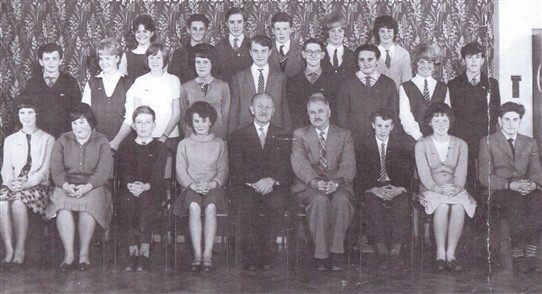 The picture below show Staff and Prefects at Sconce Hills Secondary School in Newark in 1963 - 64. Are you in the picture, or can you name any of the people? Did you attend the school, and if so, what are your memories. Please leave your memories via the 'Comments' link below. This page was added by Website Administrator on 19/01/2017. I am sat on the front row, right hand side. Other people in the photo are Philip Goy, Jane Scofield, Mervyn Squires, the late Susan Bugg, Maurice ? Many thanks for the identification, Angela. You mention other people in the photo. Are you able to locate them for use eg back row 3rd from left etc - so we can put names to faces. Any help would be much appreciated. Philip Goy is sat next to me on the front row, 3rd from right. Irene Schofield, not Jane, is on the front row, 2nd from left. Mervyn Squires, back row, 3rd from left. Susan Bugg, middle row, 2nd from left. Maurice Thurman, middle row, 4th from right. I was in class 4c and was known for my running in sports, fastest in the school, the fourth person from the right looks like the woodwork teacher, not sure if it were mr wood or mr lee. can never understand why they had to pull down such a brilliant school. Middle row 3rd from right Raymond Atkins. Front row 4th from right Mr Lee(Woodwork). Hi Angela and Vernon. Best wishes to your Mum Gemma. I went to Sconce Hills School 1955 to 1959 ... I was in the school choir .. Miss Tipular? was the music teacher at that time ...I remember ..Ann Short, Elsie & Edna Jones, Tony Severs among other's ... I know we had quite a few Pictures taken but my parents didn't buy them ... I loved going to this school and was very sorry to find it had been pulled down. My father Len Martin was Deputy Head for a short time in 1963-64 before passing away unexpectedly. Middle Row - L-R. First person, David Walker ?, fifth from left - Christopher Robb? End of line, Joe Clarke? Front Row L-R - Patricia Collar, Irene Schofield, Andrew Locke? End of line, Peter Shimeld? Rethink on end of middle Row, right.......? Lane? Back Row end - Right, Could be Diane Coupland. Back Row, next to Charlie Watson is Mervin Squires. I attended the School between 1952 - 1956 and have a class photograph taken circa 1955 The photo on this page was taken around the time I left school. I remember Mr Lee the woodwork teacher (we nicknamed him Tash Lee). I Think it is Mr Bond, the headmaster who is sitting next to him.